Have you ever caught a fish and realized the hook was too deep in it's mouth for you to be able to safely remove it? Yes, it's happened to me also. I've even caught fish with another hook buried deep in it's throat left there from a previous angler catching that same fish. It was obviously hungry. After all, they do have to eat to survive too. That's one of the interesting things about catch and release. The fact that it had survived even with a hook embedded inside of him shows the determination and the will to survive, live long, and thrive. Deep hook sets can and will happen. Especially with soft plastic baits and realistic looking fishing lures. This often happens because the fish will engulf the bait into it's mouth, begins to devour it, and the angler sets the hook a little late. The sooner the fisherman can set the hook, the better the chances are to get a proper hook set into the lip area. There are other times when fish will attack the lure as it is quickly swimming straight towards it. As soon as it is sucked in, the lure goes straight to the back of the mouth. The hook will become embedded as soon as the fish attempts to move the bait around to crush and eat it, or as soon as the angler swings the rod to set it. What to do about a fishing hook buried deep inside the fish? I always carry a pair of long-nosed Rapala fishing pliers with me when I go freshwater fishing. These multi-use pliers usually work very well for me whenever I have a hard time removing the hooks by hand. With the exception of those deeper hooks. You can get your own set of Rapala fishing pliers right here. The first thing I would suggest is to try using a fish hook removal tool. If you don't own one, consider getting one. They are a great investment as they will come in handy. You can use them all the time, rather than only when you're faced with this particular problem. Be careful when trying to remove the hook. Back the hook out the same way it entered. If it seems like it will tear up it's guts and/or will be bleeding profusely, then the fish will be better off if you just left it in. If you can't remove that deep hook, you can leave it in and often times the fish will be okay. Just snip the line as close to the hook eye as possible. Many fishermen will assume that the fish will not survive with a hook inside of it. So, they decide to cook the fish up. That's fine and all, but the fact is that fish can survive with a fish hook. Not all of them will make it, but most do. How can fish survive with a fishing hook stuck inside of it? Sometimes the hook will eventually work it's way loose and the fish will just spit it out. It is said that fish have a special kind of saliva. But really, they have a high acid count in their stomachs. The acid helps to dissolve foreign objects like hooks over time. It is also believed that hooks will corrode and rust out. However, that process takes quite awhile and the fish will probably die of old age before that happens. It also seems that fish are able to form a protective layer of growth over the hook in certain circumstances. 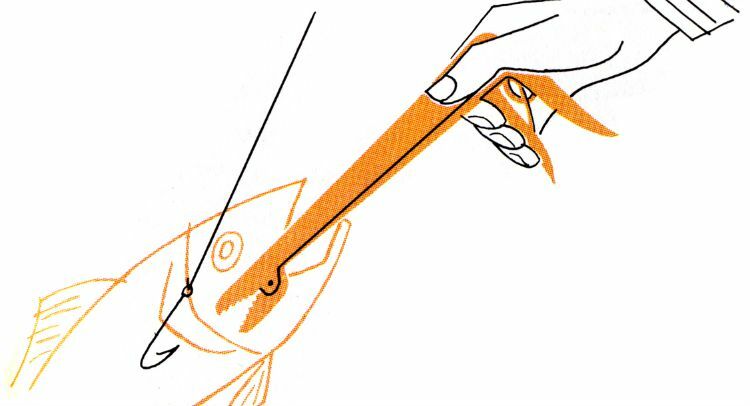 The bottom line is not to panic if your fish hook is lodged deep inside the fish' mouth. For those of you who are catch and release purists, those fish can survive at a great rate. Otherwise, you just caught yourself a healthy meal, right? These Bass Pro Shops Stainless Steel Hook Removers are ideal when trying to remove deeply sunk hooks and hooks from tooth-filled mouths. The Hook Removers tube and plunger are both made from quality 420 stainless steel for durability.